Police have admitted that they received at least 20 calls reporting suspected gunman Nikolas Cruz in recent years, and his former classmates said they received multiple death threats from him. Parkland, Florida – As new information surfaces surrounding the mass shooting that killed 17 people at Marjory Stoneman Douglas High School last week, it is becoming even more apparent that law enforcement blatantly ignored a number of warning signs about the suspected gunman, which included 20 calls to police detailing death threats and violent behavior. Broward County Sheriff Scott Israel admitted that there were at least “20 calls for services in the last few years” regarding Nikolas Cruz, who is now accused of entering the school he was expelled from and opening fire on his former classmates and teachers. Israel said that given the latest allegations against Cruz, the department now plans to review the reports they have received in the past. However, Israel did not explain why the guards were not able to apprehend Cruz before he reportedly opened fire inside multiple classrooms. The sheriff also did not address how police responded to the 20 calls they received about Cruz’s violent behavior and apparent death threats. Multiple students are now speaking out and saying that they received death threats from Cruz, which they reported to the school. 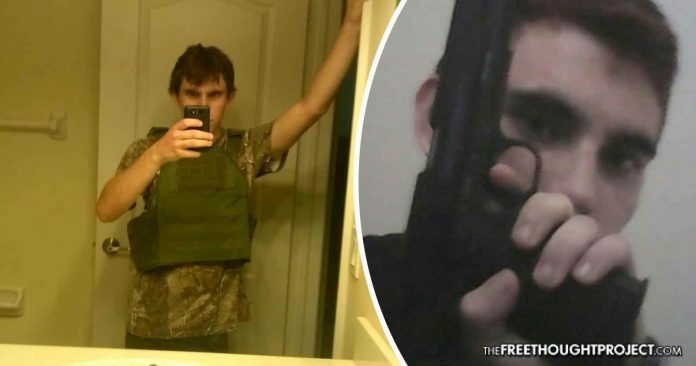 Enea Sabadini, a former classmate, told Buzzfeed that he began receiving messages from Cruz on Instagram saying things such as “iam going to shoot you dead” and “Im going to watch ypu bleed,” after he started dating Cruz’s ex-girlfriend last year. Another former classmate, Connor Dietrich, told the New York Post that Cruz was obsessed with his girlfriend and after she broke up with him, he became wildly jealous and began stalking both her and her new boyfriend. Dana Craig said she was friends with Cruz’s girlfriend and she was one of the people who encouraged her to break up with him after she heard stories of his abusive behavior. She told Buzzfeed that Cruz began targeting her in April 2016 when he heard the advice she gave about his relationship. “I’m going to get you and I’m going to kill you because you took this person away from me. I’m going to kill your family,” Craig recalled the messages saying. She noted that they were sent from the girlfriend’s Instagram account, which Cruz had access to. Craig said she also reported Cruz’s behavior, which means that there were at least two students who reported the death threats they received from a fellow classmate whose Instagram account featured photos of him brandishing guns, knives and showing off small animals he had murdered. Not only did the local police department fail to address legitimate concerns from students who saw Cruz on a daily basis and received death threats from him online, but the FBI also failed to act when it received at least two credible tips about Cruz’s plans to carry out a mass shooting.